Compared to the main expanse of mainland Australia, Tasmania really is a very manageable island and those on holiday in Hobart will find many enticing attractions outside of the city. Day trips from Hobart are popular, with tempting sights drawing people to suburbs such as Brighton, Margate, Ponteville and Taroona. 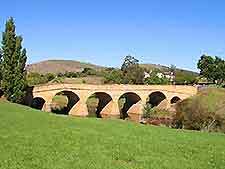 Also within comfortable driving distance is the town of Richmond, which lies to the north-east and resides within the Coal River area. Richmond Bridge is especially historic and dates way back to 1823, while if you are here as a family, then the attractions at the neighbouring Zoodoo Wildlife Park will likely appeal, ranging from native Aussie creatures such as emus, kangaroos, koalas, ostriches, wallabies and wombats, to African lions, Bengal tigers and various monkeys. An excursion from Hobart to the Tasman Peninsula also comes highly recommended, with its old towns and villages, plentiful bushwalking trails, Tasman Arch and much-visited Port Arthur Historic Site. The interesting suburb of Taroona is situated around 11 km / 7 miles from central Hobart and is actually the Aboriginal word for 'seashell'. Taroona's most popular attraction is without doubt its Shot Tower, where lead shot for guns was once produced by literally dripping molten lead from the top, which created perfect spherical shots. Visitors may also like to check out the Alum Cliffs and perhaps enjoy an hour or two sunbathing on Taroona Beach. The small town of Kingston has a population of around 13,000 residents and is located to the south of Hobart. Home to the important headquarters of the Australian Antarctic Division, next to the Channel Highway, other attractions in the area include Kingston Beach - a popular destination for swimming and sailing, and Tinderbox - a small district with an underwater snorkelling trail. Margate is situated approximately 8 km / 5 miles from Hobart and is a tiny town, with a rich railway heritage and a population of less than 1,000 people. Containing the last passenger train used in Tasmania, regular buses travel from Hobart to Margate and nearby Kingston, on weekdays and each Saturday. The small town of Richmond, with a population of around 800, ranks amongst the most important heritage towns in Tasmania. Home to Richmond Bridge - one of the oldest bridges in the whole of Australia, other highlights include around 50 buildings dating from the 19th century, the Old Richmond Gaol and many magnificent churches. Of note, Richmond can be found just 24 km / 15 miles from Hobart. 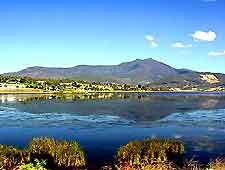 Situated in the scenic Derwent Valley area, close to Hobart and next to the Derwent River, New Norfolk has a population of around 7,000 residents. Originally known as Elizabeth Town, New Norfolk features a mixture of old and new buildings, with attractions including a visitors' centre, the Oast House, St. Matthew's Church of England, the Fletcher Challenge Paper's Boyer Mill, the Salmon Ponds, the Pulpit Rock Lookout, Jet-Boat Rides and large parklands. 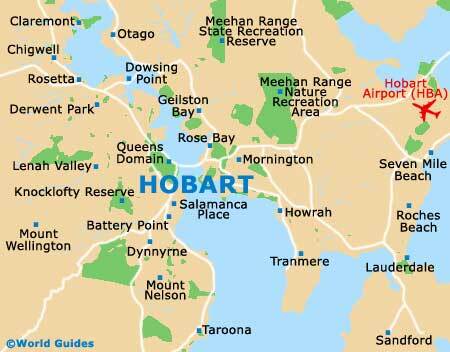 Hobart Coaches operate regular buses travelling to and from this small town - Monday to Saturday. Brighton can be found around 25 km / 16 miles to the north of Hobart, on the Midland Highway, being next to the small town of Ponteville. Attractions in both of these historic areas include numerous interesting buildings built in the 1830s, the colonial Georgian Barracks house, St. Mark's Anglican Church and the impressive Bonorong Park Wildlife Centre.